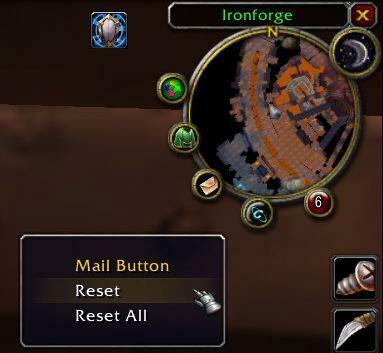 Makes the Minimap Buttons draggable around the minimap with adjustable angle. Control-Right-Click to bring up menu. This version is standalone with embedded SeaHooks and SeaPrint. Localized for English, French and German. GUI Options - Optionally uses Khaos for GUI. Khaos Options available to enable/disable for different players and a button to reset all. Call MobileMinimapButtons_AddButton(frameName, localizedFrameName) to add the button to the list of mobile minimap buttons. It will store the reset position when this function is called or when the variables are loaded, whichever comes last. In the XML or before the function call, position the button frame to its reset position, preferably relative to Minimap frame. Optimal Button size is 32x32. 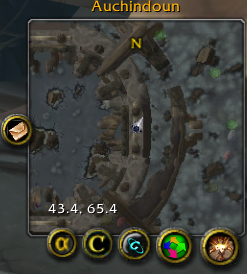 NOTE: The button/frame, MUST have the same effective scale as the Minimap. The best way to guarantee this is to make sure that the Minimap (or MinimapCluster) frame is the Parent of your button. Or if the Minimap scale has not been changed independantly of the UIScale, then the UIParent can be the button's Parent. This is important for calculating the correct radius. - Optimized the dragging radius, angle and offset code. Special thanks to Iriel and Cide for trigonometric help. - Updated localization format so that they are easier to update and not independant. - Added Mobility to the World Map Button and the Feedback UI Button. - Now automaticly makes mobile the following addon buttons: Soundtrack, Cirk's Blessings, CritLine, AlphaMap, and Natur EnemyCastBar. - Fixed Census button mask. - Implimented HasScript so that you no longer have to pass weather the frame is a button or not. - Added dynamic button adding using MobileMinimapButtons_AddButton at any time. - See API.txt for details on how to make your addon's button mobile. Doesnt seem to support the minimap buttons added by "X-Perl Unit Frames" and " Trinity". Works for everything else (including the tracking button) for me. What are the frame names of those buttons? MMB has an exclusive list so it only moves addons on the list. And it's obviously not exhaustive. There are still a couple of buttons that don't seem to be picked up for the raidus thing, aka the Tracker Button, but meh, I can move most of the smaller ones around to accomedate now. nope, radius hasn't been implemented. I'll add the chat and and movie recording frame to the next version. Edit: Now Radius has been implimented. I had been meaning to do it, but it was hella hard and took more trig/math skills than I had. Note to self: fix the offset for default buttons for next vers. it's a lil off atm for newly added buttons, but corrects itself if you've already moved them. Last edited by AnduinLothar : 11-27-07 at 02:54 AM. to make it possible to move the voice chat icon around. Question: Is 'radius' meant to be working? cause I can't seem to get it to work for me. shift+control don't move the icon in or out from the minimap for me. Last edited by Maziel : 11-24-07 at 07:12 AM. Sorry about that. I'm still fine tuning my embedding script. I usually test with the addons unembedded, but I got tired of embedding dozens of libraries and testing each one every time I updated. So, Kergoth, is there a way I can fix this while waiting for the author to do so? Yep, just edit embeds.xml with a text editor (i.e. notepad). Change the line that has "Libs\SeaString\SeaPrint.xml" to read "Libs\SeaPrint\SeaPrint.xml" instead, and restart wow. Might want to start checking FrameXML.log for errors before doing releases. MobileMinimapButtons.xml refers to Libs\SeaString\SeaPrint.xml, which does not exist. Libs\SeaPrint\SeaPrint.xml does, which explains why Sea.io is not available with the embeds. 2.3c didn't fix it, the error is still there, so is the (non)behaviour of the tracking. I can't dulicate. If you're still gettign the error try moving SeaPrint and SeaHooks from the Libs folder to your addons folder. [b]I get this error in MobileMinimap Buttons version 2.3b when I click the new tracking thing -the looking glass at the minimap- that Blizzard introduced in 2.3, the menu that lets you select something to track doesn't come up at all. I've been writing a new packaging script and somehow the xml code to embed the libs got removed. Last edited by AnduinLothar : 11-21-07 at 12:18 PM. I get this error in MobileMinimap Buttons version 2.3b when I click the new tracking thing -the looking glass at the minimap- that Blizzard introduced in 2.3, the menu that lets you select something to track doesn't come up at all. Disabling MMB fixes it but that's not what I want of course.